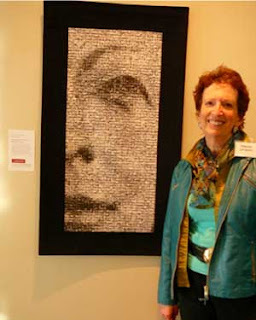 FAO member, Nancy G. Cook was awarded Juror's Choice by Susan Brandeis at the ArtQuilts Transitions show at the Durham Arts Center in Durham, NC. 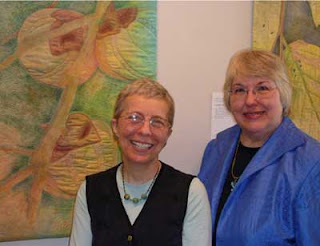 Susan Brandeis (left) and Nancy in front of Nancy's award winning piece, Winter Fruit. Deborah Langsam, another quilt artist from Charlotte, NC was awarded Member's Choice at the same show for her piece Under the Watchful Eyes of Charlotte. Deborah and her piece are shown. Both Janet and I are teaching online courses this spring/summer at Joggles. I took an online course last summer, learned a ton and got completely hooked on the concept. No matter where you live, now you can take a course to learn something new or improve your technique, via the internet. If you’ve never taken an online course, here’s how it works: You sign up and pay the class fee. A few weeks before the class starts, they send you a supply list. On the first day of the class, you get an e-mail that gives you information and passwords for signing up to participate in the class forums. Here, you can write messages to the instructor, share your thoughts, progress and photos of your work with your fellow students. You don't have to participate in the forums, or you can just lurk and read your fellow students’s comments, so it is perfect for people who are a little introverted, too! Each week of the class, you receive an e-mail with the lesson in PDF format. When I took an online course, I learned a ton from the teacher and my fellow students, and made some wonderful online friends, too. There is lots of fun and sharing that goes on. Janet’s class, Introduction to Textural Beading and Embellishment, starts June 10, and costs $60 for six lessons. My class, Tyvek Explorations, starts July 28. Four lessons cost $40. So please, join us! You’re bound to learn something new, and have a lot of fun doing it.